Researchers at the University of Strasbourg in France have found a cool way to study penguin populations without necessarily getting close in person or causing them to panic in any intrusive manner. 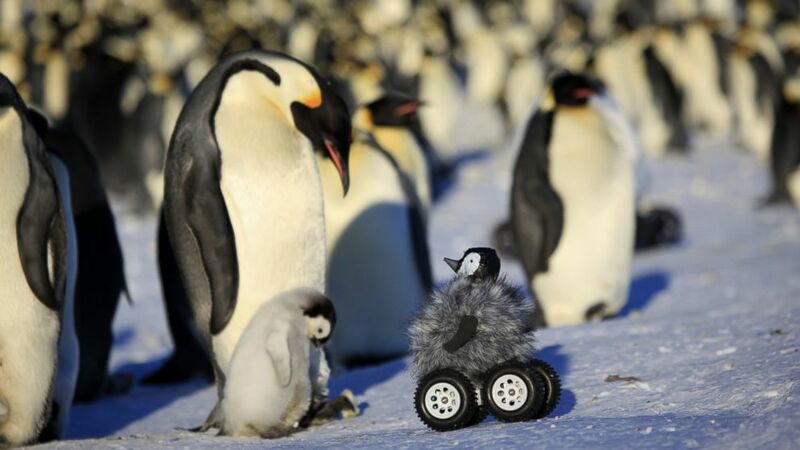 They achieved this feat by designing and sending a robotic rover that is camouflaged with a stuffed penguin – and this was used to study the behavior of penguins in their natural habitats. The researchers understood the difficulty of getting up-and-close with penguins without affecting their behaviors or influencing their reactions in any way. But the remote-controlled penguin rover solved the problem because many animals, penguins inclusive, turned out to be less skittish around the stuffed rovers just as they usually are around humans. The researchers sent another rover which was never disguised with a penguin chick stuffing, and the male penguins reacted by clutching their eggs tightly under them with exaggerated protectiveness. Some animals tend to be more aware of the stuffed rover than others, and their reactions to the roving machine is from surprise to indifference. The penguin-stuffed rover is equipped with a heart rate monitor that is capable of reading the animals heart rates from a distance of 60 centimeters away. Measuring the heart rates of penguins or other animals from this distance allowed researchers to measure the amount of stress and psychological processes going on within the monitored animal.